Water is used extensively throughout textile processing operations. Almost all dyes, specialty chemicals, and finishing chemicals are applied to textile substrates from water baths. In addition, most fabric preparation steps, including desizing, scouring, bleaching, and mercerizing, use aqueous systems. The amount of water used varies widely in the industry, depending on specific processes operated at the mill, equipment used, and prevailing management philosophy concerning water use. Textile operations vary greatly in water consumption. Figure-1 summarizes the water consumption of various types of operations. Wool and felted fabrics processes are more water intensive than other processing subcategories such as wovens, knits, stock, and carpet. Water use can vary widely between similar operations as well. For example, knit mills average 10 gallons of water per pound of production, yet water use ranges from a low of 2.5 gallons to a high of 45.2 gallons. Textile industry is a leading consumer of water and it ranks among ten top water consuming industries. 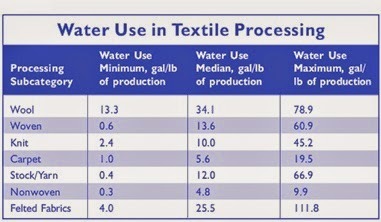 Table-1 shows the approximate consumption of water for the processing of various textile fibres. Cotton fibres require the largest amount of water for its preparation. In general, the water consumption in a process house is about three times the consumption of all other units put together (Table-2). The water consumption in the bleaching section is highest. The conventional preparatory processes of textiles namely, desizing, scouring, bleaching, and washing are highly water consuming operations and consequently energy-intensive (Table-3).